This tutorial will teach you how to write pong using Kivy. 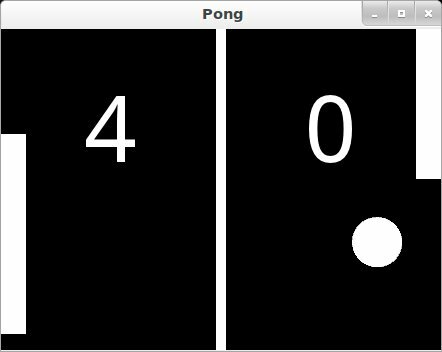 We’ll start with a basic application like the one described in the Create an application and turn it into a playable pong game, describing each step along the way. You know how to run a basic Kivy application. See Create an application if you don’t. If you have read the programming guide, and understand both basic Widget concepts (A Simple Paint App) and basic concepts of the kv language (Kv language), you can probably skip the first 2 steps and go straight to step 3. Ready? Sweet, let’s get started! Go ahead and run the application. It should just show a black window at this point. What we’ve done is create a very simple Kivy App, which creates an instance of our PongGame Widget class and returns it as the root element for the applications UI, which you should imagine at this point as a hierarchical tree of Widgets. Kivy places this widget-tree in the default Window. In the next step, we will draw the Pong background and scores by defining how the PongGame widget looks. We will use a .kv file to define the look and feel of the PongGame class. Since our App class is called PongApp, we can simply create a file called pong.kv in the same directory that will be automatically loaded when the application is run. So create a new file called ``pong.kv`` and add the following contents. COMMON ERROR: The name of the kv file, e.g. pong.kv, must match the name of the app, e.g. PongApp (the part before the App ending). If you run the app now, you should see a vertical bar in the middle, and two zeros where the player scores will be displayed. Before going on to the next step, you might want to take a closer look at the contents of the kv file we just created and figure out what is going on. If you understand what’s happening, you can probably skip ahead to the next step. This first line is required in every kv file. It should start with #:kivy followed by a space and the Kivy version it is intended for (so Kivy can make sure you have at least the required version, or handle backwards compatibility later on). Like Python, kv files use indentation to define nested blocks. A block defined with a class name inside the < and > characters is a Widget rule. It will be applied to any instance of the named class. If you replaced PongGame with Widget in our example, all Widget instances would have the vertical line and the two Label widgets inside them because it would define these rules for all Widget instances. define a canvas section in which you can add Graphics instructions that define how the widget is rendered. So this canvas block says that the PongGame widget should draw some graphics primitives. In this case, we add a rectangle to the canvas. We set the pos of the rectangle to be 5 pixels left of the horizontal center of the widget, and 0 for y. The size of the rectangle is set to 10 pixels in width, and the widget’s height in height. The nice thing about defining the graphics like this, is that the rendered rectangle will be automatically updated when the properties of any widgets used in the value expression change. Ok, so we have a basic pong arena to play in, but we still need the players and a ball to hit around. Let’s start with the ball. We’ll add a new PongBall class to create a widget that will be our ball and make it bounce around. To make it all work, you also have to add the imports for the Properties Property classes used and the Vector. Note that not only a <PongBall> widget rule has been added, but also a child widget PongBall in the <PongGame> widget rule. Cool, so now we have a ball, and it even has a move function… but it’s not moving yet. Let’s fix that. This line for example, would cause the update function of the game object to be called once every 60th of a second (60 times per second). We have another problem though. We’d like to make sure the PongBall has its move function called regularly, but in our code we don’t have any references to the ball object since we just added it via the kv file inside the kv rule for the PongGame class. The only reference to our game is the one we return in the applications build method. At this point everything is hooked up for the ball to bounce around. If you’re coding along as we go, you might be wondering why the ball isn’t moving anywhere. The ball’s velocity is set to 0 on both x and y. In the code listing below, a serve_ball method is added to the PongGame class and called in the app’s build method. It sets a random x and y velocity for the ball, and also resets the position, so we can use it later to reset the ball when a player has scored a point. Sweet, our ball is bouncing around. The only things missing now are the movable player rackets and keeping track of the score. We won’t go over all the details of creating the class and kv rules again, since those concepts were already covered in the previous steps. Instead, let’s focus on how to move the Player widgets in response to user input. You can get the whole code and kv rules for the PongPaddle class at the end of this section. In Kivy, a widget can react to input by implementing the on_touch_down, the on_touch_move and the on_touch_up methods. By default, the Widget class implements these methods by just calling the corresponding method on all its child widgets to pass on the event until one of the children returns True. Pong is pretty simple. The rackets just need to move up and down. In fact it’s so simple, we don’t even really need to have the player widgets handle the events themselves. We’ll just implement the on_touch_move function for the PongGame class and have it set the position of the left or right player based on whether the touch occurred on the left or right side of the screen. This algorithm for ball bouncing is very simple, but will have strange behavior if the ball hits the paddle from the side or bottom…this is something you could try to fix yourself if you like. # went of to a side to score point? Make the game end after a certain score. Maybe once a player has 10 points, you can display a large “PLAYER 1 WINS” label and/or add a main menu to start, pause and reset the game. (Hint: check out the Button and Label classes, and figure out how to use their add_widget and remove_widget functions to add or remove widgets dynamically. Make it a 4 player Pong Game. Most tablets have Multi-Touch support, so wouldn’t it be cool to have a player on each side and have four people play at the same time? Fix the simplistic collision check so hitting the ball with an end of the paddle results in a more realistic bounce.